As part of The Golfers Club membership you can also have insurance for your golf buggy or golf cart, and if you’re over 50 you’ll benefit from a 10% discount. If you rent a golf buggy and just need Liability insurance, the standard insurance that comes with The Golfers Club membership will provide Liability cover. However, if you have your own personal golf buggy then there is a range of golf buggy insurance available to suit your requirements. Whether a single seater or a multi seat buggy, golf buggy insurance ensures that your golf buggy or golf cart is covered for theft, loss or damage. The insurance also provides cover in case of an injury caused by the golf buggy. If you leave your buggy at the golf club, choose the Buggy Club option below, but if you take your buggy home and keep it there, choose the Buggy Home & Club option. Important Note: To purchase buggy insurance you must also be a member of The Golfers Club. The Golf Buggy equipment excess is £150 and cannot be waived. Driving buggies around golf courses sounds like fun, but sometimes on the varied terrain of the course there can be accidents. This is why it is advisable to have a golf buggy insurance; accidents and injuries can happen to the best of us. Golf courses aren’t the flattest places to drive around so it’s a case of safety first when driving as there are lots of golf buggy related accidents every year caused by a variety of reasons; their open design, lack of seatbelts and braking capabilities can leave you vulnerable in certain situations. In addition, most golf buggies are equipped with mechanical rear brakes only (instead of four wheel brakes like cars), significantly limiting their stopping ability. 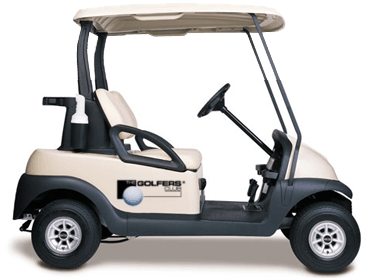 Of course, it almost goes without saying that golf buggies are expensive and the cost of replacement in the event of theft or repair if damaged can be significant. Simply click here to add golf buggy insurance to your membership, or alternatively call our Membership Team on 0800 158 5550.